Some exceptionally fine 'super ground' grades are available which can be made into casting slurries of very high specific gravity and which cast well with very low shrinkage (even though alumina powder is not a plastic material). Deflocculation can be achieved using a low pH (3.5-4.5) positive anion mechanism employing hydrochloric or nitric acid, a high pH (11-12) cation mechanism with alkali hydroxide salt additions, or with the addition of standard alkali polyelectrolyte dispersants. 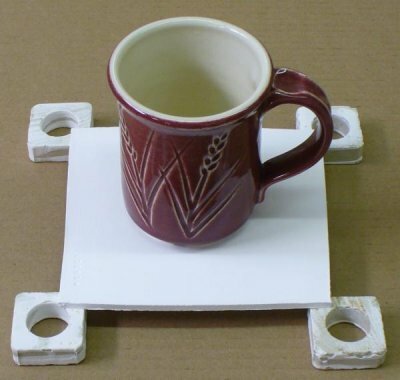 With the addition of organic binders, alumina bodies can be cast and pressed into a wide variety of shapes requiring heat and abrasion resistance. Alumina parts are then sintered to permit discrete crystals to react with each other to form larger ones. Coorstek AD-94 is an example of a very high alumina content body, they publish alot of physical data about the material. Calcined alumina can be substituted for silica filler in porcelain bodies (325 mesh). It reduces shrinkage, increases thixotropy, provides strength in the kiln minimizing warping, benefits glaze fit, and adds fired strength. The book "Clay Bodies" by Robert Tichane has more information on this. It is made from 96.5% calcined alumina and 3.5% Veegum (to provide plasticity for forming). At cone 6, with no prior firing to a higher temperature, a 5mm thick slice can support a mug like this, demonstrating how refractory alumina is. You can make larger shelves, big enough for small electric kilns, however, since you likely do not have a furnace to fire these as high as they should be fired to sinter them properly (for hot strength), remember to support larger spans in the center to prevent sagging. 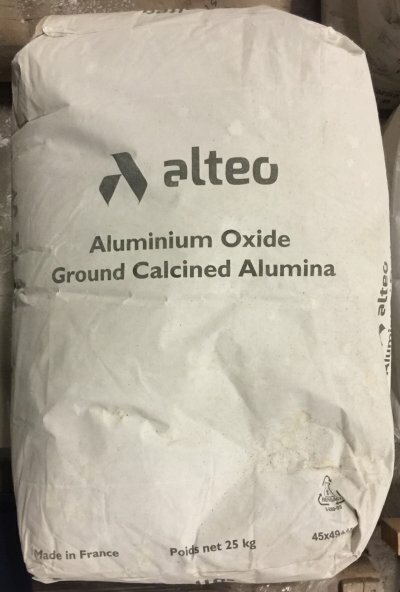 Also note that alumina does not have nearly the thermal shock resistance that cordierite has (which, by the way, you can also make yourself if you can fire to 1350C). The home-made kiln shelf (left) was fired it at cone 10. It is half the weight (and thickness) of the cordierite one (but remember that it does not have the thermal shock resistance of cordierite). It is made from a body consisting of 96.25% calcined alumina and 3.75% Veegum. It rolls out nicely and dries perfectly flat over about three days. But the Veegum does not give up its water easily. I cut it 1/4" larger than the other and it has fired to the same size; this body has incredibly low shrinkage. 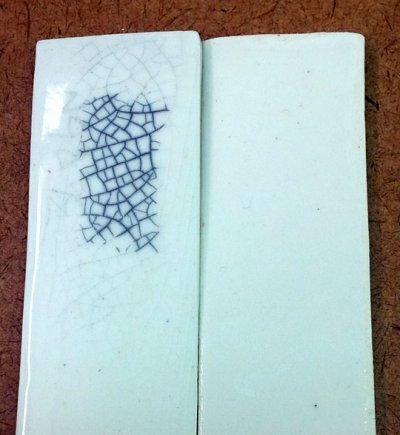 These are glazed test bars of two fritted white clay bodies fired at cone 03. The difference: The one on the right contains 13% 200 mesh quartz, the one on the left substitutes that for 13% 200 mesh calcined alumina. Quartz has the highest thermal expansion of any traditional ceramic material, alumina has the lowest. As a result the alumina body does not "squeeze" the glaze (put it under some compression). The result is crazing. There is one other big difference: The silica body has 3% porosity at cone 03, the alumina one has 10%! I mixed a cone 6 porcelain body and a cone 6 clear glaze 50:50 and added 10% Mason 6666 black stain. The material was plastic enough to slurry, dewater and wedge like a clay, so I dried a slab and broke it up into small pieces. 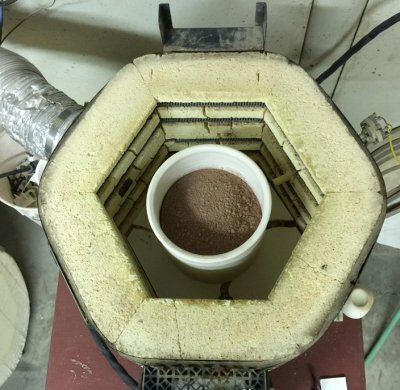 I then melted them at cone 6 in a zircopax crucible (I make these by mixing alumina or zircopax with veegum and throwing them on the wheel). 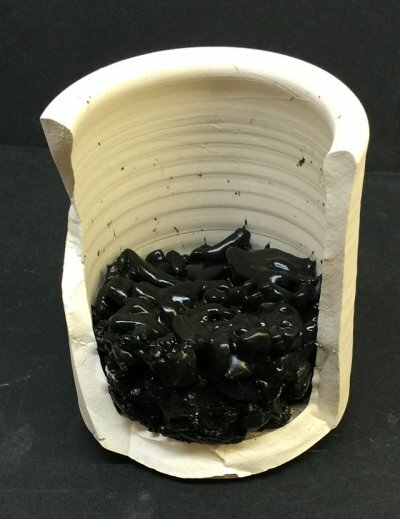 Because this black material does not completely melt it is easy to break the crucible away from it. As you can see no zircon sticks to the black. 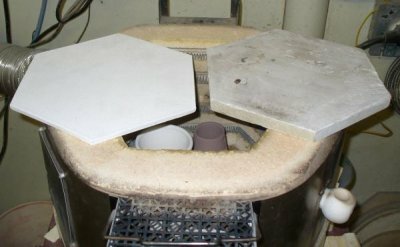 I then break this up with a special flat metal crusher we made, size them on sieves and add them to glazes for artificial speckle. As it turned out, this mix produced specks that fused too much, so a lower percentage of glaze is needed. I can thus fine tune the recipe and particle size to theoretically duplicate the appearance of reduction speckle.